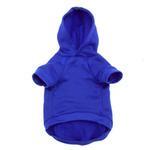 Keep your pet warm, comfy, and cute in the in the Barking Basics!® Dog Hoodie in Blue! Your search for the perfect pet hoodie is over! 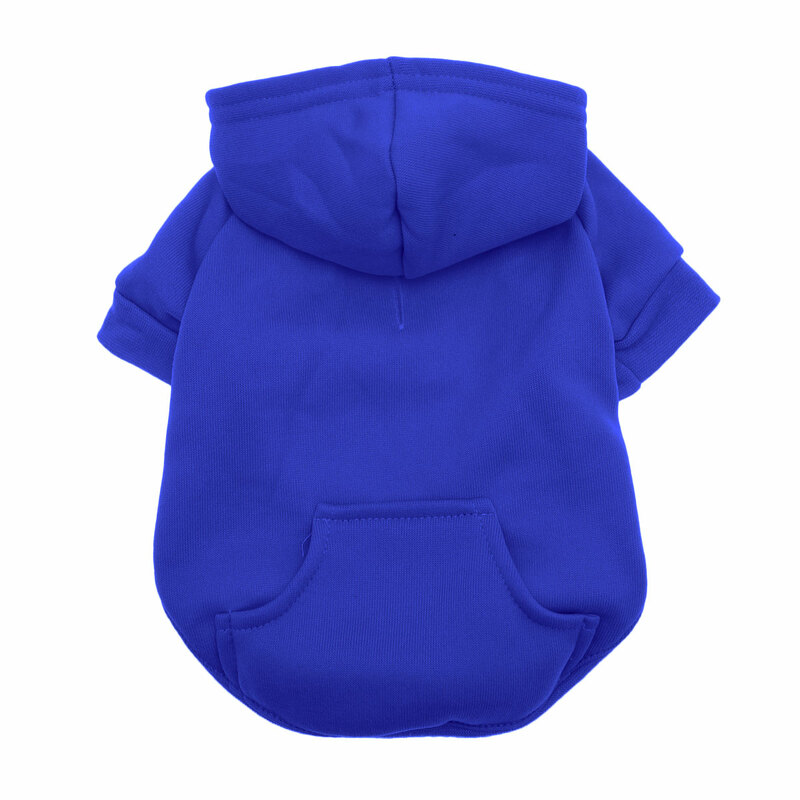 The Barking Basics!® Dog Hoodie in Blue is sure to be your dog or cat's favorite wardrobe item to keep them looking good and staying toasty. This cheery blue hoodie is an excellent color choice for patriotic events. You'll love customizing your pet's hoodie with embroidery or screen printing for special events or your favorite team. Barking Basics Dog Hoodie - Blue Customer Photos - Send us your photo! Baby (left, a terrier mix) was jealous of her sister Cammy's adorable pink hoodie, so she just got one in blue! She wears an XL; it's a bit long for her back, but we ordered this size knowing the chest fitting was more important. Cammy wears a size L.
SnickleFritz is all tired out after his walk and is enjoying a nice nap on the couch in his comfortable hoodie. SnickleFritz is ready to go for his walk outside in his new hoodie. My boy is wearing a 3x. He is 107lbs,girth 36”. He’s not done growing. I probably could have gone with a 2x for a tighter fit around his belly & shorter length if he were done growing. Just what Jaybaby needs. I washed this prior to letting him wear it. Color didn’t run & it didn’t shrink in the dryer. Great quality, not too bulky for times when it’s just a bit nippy outside. Mocha is 10 years old, and this hoodie is perfect for keeping her body dry when she plays in the snow! Flint loves to get dressed every morning! He loves his hoodie and it is soft on the inside and keeps him cozy warm! My 90lb American Staffordshire Terrier/Rottweiler mix sporting a size 3XL. It's kind of long and I hope that it will shrink some in the washer. Next time I will buy a 2XL. He loves it and it keeps him nice and cozy during the brutal cold months. Fenway is a chihuahua/rat terrier mix and he loves his size small gray hoodie!!! He loves Baxterboo and he gets so excited when his new items from there arrive in the mail! Winston is my 12 week old English Bulldog puppy. The hoodie fits him well and looks pretty cute. We in Chicago were experiencing a very cold snap. I ordered the Alpine All Weather Dog Coat and the Barking Basics Hoodie. Now Artie is warm and able to be outdoors to have fun while looking adorable too. Teddy, looking handsome as ever! Chevy loves his hoody! He matches my fly! Posted On 03/12/19 by Katie A from Glendale Heights , IL Yes, Katie A recommends this product! Baby was jealous of her sister's pink hoodie, so she just got it in blue! The fleece is very warm for cold Chicago winters. Definitely agree measuring chest/ribcage size is most important. Posted On 02/26/19 by Susie A from , KS Yes, Susie A recommends this product! It is so chilly outside but our 2 danes... just relaxing in their hoodies. Super warm and comfy! Not only do they enjoy wearing the hoodie, they pout when I take it off to wash lol. Posted On 02/13/19 by Chino Hills from Chino Hills, CA Yes, Chino Hills recommends this product! Love these hoodies. We have them in several different colors. They're very cute and well made. Large was a great fit for my 20lb pug. Been buying these hoodies for several years for my three Shih tzu's and just love them. A little disappointed in the fabric and the fit the on this particular blue hoodie, as it is more polyester then the soft cotton sweatshirt material that I have purchased in the past. Also this hoodie has snaps on the neck instead of the draw string which makes the hood a little sloppy and larger not a good fit.. Other then that the color is beautiful and the coat itself is a great fit in length. All three of my dogs wear these in many different colors all year round and love the extra warmth they provide especially in the cooler months. People, remember it's important to measure your pets neck, chest and length to have the proper fit. Thank you Baxter Boo we love shopping with you. Posted On 02/05/18 by Deborah Q from Biloxi, MS Yes, Deborah Q recommends this product! I bought this royal blue one for my friends furbaby for xmas. Love the color choices and the softness of the fabric. He's a pug and looks just adorable in it. Will buy one for my little guy. I’ve been buying these sweatshirts for several years and they’ve been my most favorite. I have always loved the color choices, how they looked, felt and were comfortable for my dogs. They were also made out of sweatshirt fabric which makes sense bc they were after all, sweatshirts. Now they are made of polyester. The dog hairs cling to it and they snag easy. I don’t like the look of them and they pill quickly. I’m so very disappointed in this change and will no longer be buying them for my dogs. Posted On 12/20/17 by Rachel N from Meriden, CT Yes, Rachel N recommends this product! Brownie (our Rat-chi mix) loves this sweatshirt! The quality and color are excellent! Brownie loves the texture and warmth! The fit is great! Posted On 12/12/17 by Martha M from , Yes, Martha M recommends this product! My snorkie, Abby, loves this hoodie. She will actually jump up onto the ottoman and patiently wait for me to put this on her. She loves sleeping as well as just lounging around the house on cold days in this hoodie. We love the hoodie and so does our Great Dane! Love these basic hoodies. Got the small for my 3lb poodle and she still has some extra room which I prefer. Also got one for my daughters 6lb maltipoo for Xmas. The color is a nice deep blue. It is made of a lighter weight material than a traditional hoodie so it has a little more stretch to it. We bought this for our male dobie. The chest comes down his chest and stomach too far for him to pee without peeing on the hoodie. So I would recommend getting a smaller size if you have a male than what you think you need. Fits our female Great Dane (she's small, only 100 lb) fairly well. I really like this sweatshirt because it is both warm and functional. In summer it works during cooler evenings and in fall and winter the sweatshirt layers well with walk-in harnesses in coordinating colors. As a result, I've amassed a mini-collection of these sweatshirts in diverse colors. This enables some to be washed/dried while others remain available for use outdoors when temperatures warrant. Posted On 11/17/17 by Brianna from Columbia, SC Yes, Brianna recommends this product! Posted On 11/13/17 by Bonnie Z from Menominee, MI Yes, Bonnie Z recommends this product! Royal Blue Barking Basics Hoodie is Perfect! I buy the Barking Basics hoodies for a small business I have. I have purchased purple, black, red, and now blue. This color is phenomenal! It is a deep, rich royal blue that compliments the dog's coat so well! I love the fabric of these hoodies, which is a cotton blend but feels like fleece on the inside. The hood looks absolutely adorable when up, although most dogs are not impressed to have it cover their ears. My favorite feature is the slip by the neck where you can pull the loop on their collar through to attach to a leash. Now our morning walks on cold days make me feel much better because I know my dog isn't freezing! This is perfect for my 6 month old Boston Terrier puppy. I ordered the medium and it is a little long on him but I think he likes that it covers his tail. I love the little details like the pockets and the arm cuffs. It is perfect for around the house or outdoor playtime. Posted On 11/07/17 by Tara from , Yes, Tara recommends this product! The quality for the price cannot be beat! I'm tempted to buy one in every colour! Love the comfy feel & fit of the hoodie. All three of my dogs wear these. Can't go wrong on those chilly days outside or if needed, inside. This is a nice hoodie to have for my little dogs that are from "the land of the sun" and are now living in Utah! I like that it's a warmer option than the basic t-shirts. I'd love to see you offer other options WITHOUT the hoodie - just a nice sweatshirt that's thicker/warmer. The hoodie is cute but not necessary. Love the colors that you offer - got a red one and a blue one for my two fur babies! Posted On 09/07/17 by Olivia N from , MI Yes, Olivia N recommends this product! My boy might be a tiny chunky cause it fits around his belly but it's very long on his back. Still cute! Only problem is that I washed it once and it came out all pilled on the outside. Posted On 08/26/17 by Mahonrry L from , Yes, Mahonrry L recommends this product! Posted On 07/05/17 by Louise K from Raytown , MO Yes, Louise K recommends this product! Fast delivery and bold color. I plan on ordering a couple more for my little dog Macs. Posted On 06/16/17 by Natasha M from , FL Yes, Natasha M recommends this product! Great fit and color. Good quality. Posted On 05/22/17 by Kathy H from San Antonio, TX Yes, Kathy H recommends this product! Adorable hoodie. 3x was to big for the bulldog so the boxer got it. 2x is a little tight but we can make it work for the chubby bully. This hoodie keeps our rescue warm. He loves the color too. Posted On 04/12/17 by Kathryn Nicholas from Baltimore, MD Yes, Kathryn Nicholas recommends this product! The hoodie is so cute on him. I especially like the weight of the hoodie. Posted On 03/16/17 by Kay W from , Yes, Kay W recommends this product! Wanted something to keep my pup warm during the colder days, this was perfect! Posted On 02/09/17 by Moose from , TX Yes, Moose recommends this product! cute and sturdy. medium fits a little snug on 16 lb puppy. I love this hoodie so much that I'm thinking of getting my yorkie a few more in different colors. The hoodie is adorable and the inside lining is soft and warm. I also love the fact that I can throw it in the wash with my other clothing. He has a lot of sweaters that I have to wash separately. I will say that if your dog's measurements are very close to the size listed, you might want to go up one size. I'm having to return my hoodie for the next size up because the size I ordered was too snug, even though it was within my dog's measurements. Posted On 02/04/17 by Catie B from , CA Yes, Catie B recommends this product! My pitbull loves his first one so much that I got him a second one. Posted On 02/03/17 by Sonja J from Los Angeles, CA Yes, Sonja J recommends this product! I love these hoodies and have bought a few for my dog. They are stylish and very functional! This particular order was for my local shelter. The dog kennels are outside and the shelter was short on sweaters for big dogs. I was able to get 10 of these hoodies in different colors at a great clearance price. Thank you BaxterBoo! Posted On 01/31/17 by Sharon G from Austin, TX Yes, Sharon G recommends this product! It was too small even though I checked the sizing for my older kitty who sleeps on the floor and I wanted to keep her warmer than usual. And then it might be too heavy, so I didn't re-order it. Will give to my daughter who is a veterinarian to give to one of her clients or to use in the clinic to keep a special someone warmer. Posted On 01/22/17 by Charli from Prince George, VA Yes, Charli recommends this product! My Scottie looks adorable in this hoodie! It runs a bit small, so I had to order one size larger than usual. The blue is somewhat darker than I expected by looking at the picture. I have a royal blue sweatshirt, and I thought that we would match, but alas, it was not to be!! The hoodie is still new; therefore, I don't know how washing will affect the color. The inside of the garment is warm and fleecy just like a hoodie you would buy for yourself. Overall, it's great quality. I'm happy with this purchase. I bought this for my dog. I am very satisfied with the sweatshirts. I bought 2 of them. Posted On 01/19/17 by Sarah from St. Paul, MN Yes, Sarah recommends this product! Posted On 01/09/17 by Betty P from Bakersfield, CA Yes, Betty P recommends this product! Have purchased 5 of these basic hoodies now. One ultra-violet last month - to test sizing - and 4 more colors in this order. My "nephew" Eo - a rescue Pom - has alopecia and needs pretty constant coverage to stay warm! His Mom says these hoodies fit him just right and keep him toasty. He's also cute as can be in them. Barking Basics Dog Hoodie is Great! Posted On 01/08/17 by Melde H from Lancaster, CA Yes, Melde H recommends this product! We have a 8 mo. old Whipedor (Whippet / Labrador) and even with his long body the Extra Large fits well and seems to have a calming effect on him. The construction is also very good. Posted On 01/02/17 by Anne T from Walsenburg, CO Yes, Anne T recommends this product! I finally found a sweater that my chiweenies can not get off. Posted On 01/01/17 by KELSEY D from Paso Robles, CA Yes, KELSEY D recommends this product! This Barking Basics Dog Hoodie is thick, comfortable and the color is stunning! It's perfect for winter morning and walks! Posted On 12/23/16 by Allison S from , Yes, Allison S recommends this product! I just love this dog hoodie-- my pup looks so cute when he wears it. I ordered a XXL based on the length of the hoodie which is perfect, however the waist is way too big. I have a 45 lb. German shepherd mix, so he has a long skinny torso area. The only other thing is it really can't be worn outside for potty breaks because the fabric covers that area. Overall, really cute and super soft! Posted On 12/23/16 by Shari A from , KS Yes, Shari A recommends this product! I bought a couple of these for my dog and several for gifts to other dogs. They wear nicely. So soft. Great fit. Well made. Love it. Great nice and warm hoodie and the price is great! Nice and warm and fit Cooper to a tee. He is for pounds and I followed the measurements - fit perfectly. Colors are exactly as shown. Posted On 12/21/16 by Rachel D from , MI Yes, Rachel D recommends this product! Posted On 12/14/16 by Laurie K from , IL Yes, Laurie K recommends this product! Great quality at an unbelievable price. Love BaxterBoo! Alistair has this one in hiding for Christmas morning :) But if it's as great as his red and green one he'll be thrilled. Posted On 12/14/16 by Pamela Rubar from Prescott, AZ Yes, Pamela Rubar recommends this product! Although he has not received this gift yet, i checked it over and wish i had one. Posted On 10/29/16 by Carolyn C from Alabaster, AL Yes, Carolyn C recommends this product! Super cute, soft and warm. Love the many colors these hoodies are available in. Great for fall! Posted On 09/22/16 by Connie C from Versailles, IL Yes, Connie C recommends this product! It's really a nice sweatshirt. Beautiful color! Pair this with the Barking Basics tank and you have a cozy little doggie! This hoodie has lasted through rough play, laundry and it is warm and so cute. I personalized the Blue one with a Superman Crest and the famous superman curl on the hood. Posted On 06/05/16 by Sam B from Houlton, ME Yes, Sam B recommends this product! Great product. Well made and fits well. My pup loves this cute little hoodie! Posted On 05/11/16 by Randy C from Ventura, CA Yes, Randy C recommends this product! Posted On 05/09/16 by Sonia L from Los Angeles , CA Yes, Sonia L recommends this product! I bought two hoodies : one for my four pound chihuahua and the other for my eleven pound miniature pinscher, in the sizes x small and medium, respectively. They fit both of them PERFECTLY! Such an amazing quality hoodie, perfect for cold days! Love all the different colors. Would recommend 100%! Posted On 03/05/16 by arielle b from Elizabethtown, KY Yes, arielle b recommends this product! My furbaby loves his hoodies,cant get him to keep on bandanas but he will wear his hoodie all day everyday.he had ice blue eyes and the blue hoodie looks amazing. Posted On 02/21/16 by Sandy J from Inver Grove Heights , MN Yes, Sandy J recommends this product! I love these hoodies ! 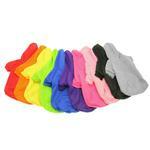 My babies like wearing them , they are comfy and soft and are great quality ! People always ask me where i got them. I always tell them where they can get them too . Baxterboo!! Posted On 02/15/16 by Mj S from , Yes, Mj S recommends this product! Beautiful color...warm and soft. My dog likes this hoodie and so do I. Posted On 02/01/16 by Genice T from Lawrenceville, GA Yes, Genice T recommends this product! Very cute and warm for my little Bella. She looks so cute in it. I really love the quality of the Baxter Boo products. The prices are reasonable and free shipping is a great bonus. Great products! Love it I have 4 in different colors. Nice Product. Really soft and great fit! Posted On 01/07/16 by Bonnie B from Winston Salem, NC Yes, Bonnie B recommends this product! I bought this for my 3 male yorkies in 3 different colors. For the sale price of $9.00- great price by the way; I was not expecting the quality of what I received. It said polyester and I did not see anything about the inside. I was excited about the fleecy inside. It was a bit long under the belly for the male dogs. I turn up shirt-tail for them to go on their potty breaks. Can't wait for my 4 girls to get their pink hoodies. SUPER QUALITY! Wow. This blue color is outstanding. and looks great on my 5 Lb Chihuahua. Everyone thinks he's so cute...and He does, too! He is cinnamon-colored, and the blue looks so good on him. It's cozy, and I like knowing that he's comfy and warm in his hoodies. He has Many of them.. THANKS! It's a nice sweatshirt, the neck opening is a bit small on all 3 of my dogs (I ordered an xs and 2 s), it's a soft material, but my biggest complaint is the belly isn't cut to accommodate my boy dogs. Now I have to do some alterations so it won't get soaked. I bought this for my dog. and I think he looks really cute in it. This size was a good fit. I would surely get this again. Very good item to warm your pet up while outside. or inside for that matter! these hoodies work well with tiki's (my yorkie) coats. Posted On 12/23/15 by Heather C from Fort Wayne, IN Yes, Heather C recommends this product! I bought this hoodie in black and blue, and my pug absolutely loves! It keeps him very warm in the cold. Keeps my little Shih Tzu warm on our winter walks. Seamus gets excited when he sees me pick up the hoodie & doesn't mind at all when I put it on him. Posted On 12/18/15 by Brittni K from , MD Yes, Brittni K recommends this product! Nice quality for price. Would maybe get a large instead of medium for my 14 lb havamalt. It's s little snug but ok.
Posted On 12/17/15 by Debra B from Madison, WI Yes, Debra B recommends this product! Small was a perfect fit for my 7 lb chi. Washed well, no pilling. Plain but functional. Not too long or short. Posted On 12/14/15 by Alissa F from Lexington, KY Yes, Alissa F recommends this product! Super cute! Great quality and the perfect fit! I'm gonna heat press his name on the pocket! I love it so much, I'm about to buy a couple more. Great product. Soft and fits true to size. Posted On 11/30/15 by Jackie W from New York, NY Yes, Jackie W recommends this product! This is a great hoodie. My dog is female pittbull so the chest is the right size however the back is a bit too long for her, I had to do some alteration, but this is why she has a Mommy! Otherwise, it is a nice warm hoodie and I believe it will be useful this winter. Posted On 11/25/15 by val m from Apex, NC Yes, val m recommends this product! Thick, warm, comfy. Nice fit and cozy for dog. We love the hoodies! Just right for cool weather. They look so cute on Henry and are comfortable, durable and stylish. Henry loves to wear them so we have this item in several colors. They fit the BIG guys. Thanks, BaxterBoo!! Posted On 11/20/15 by Kelly W from Seattle, WA Yes, Kelly W recommends this product! Posted On 11/19/15 by Audrey F from , OR Yes, Audrey F recommends this product! Great product, fits true to size & adorable on! I have a happy happy pup! BaxterBoo website ROCKS!! Great products and great customer service!